Car is in shop for recal and some things Planet Ford couldn't seem to fix properly. Dropped off at Lincoln Dealership to see if it is any different. Just noticed the antenna placement for the panoramic roof models on the show floor. Interesting. I'm surprised they wouldn't do an in glass antenna. That looks so primitive! This is what I remembered at the dealer. This would work with the panoramic roof models. That was on the rear too and out of the way of the roof. Two antennae? The puck on the deck lid is the Sirius Antenna. 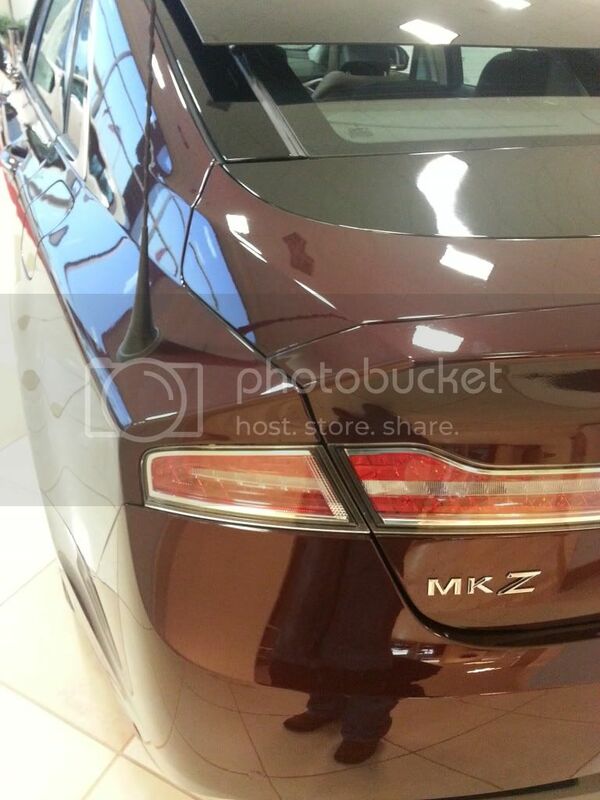 Only MKZs with the panoramic roof have that silly rear mount antenna. All other models utilize a trunk mount antenna bolted to the area behind the taillight plastic trim. I am assuming it uses the car body as the antenna. The trunk puck also serves as the GPS antenna. Any pics of the non roof antenna? I personally prefer a real antenna after experencing those window installed garbage ones.